Is the law closing in on the Martinellis, or are they long gone? A taunting Twitter tweet from one of Martinelli’s newspapers, retweeted by Martinelli. Are we dealing with confidence, or desperation? One of the usual indicators of likely political fortunes is that those who practice violence but don’t own up to it sometimes get away with it, those who practice violence and vehemently defend it often have better luck, but those who talk about violence that they don’t and can’t put into practice are pathetic losers. When Ricardo Martinelli retweeted a sycophant’s Twitter message about how any violence that befalls Panama will be Juan Carlos Varela’s fault, he may have escaped the latter fate. It was quickly taken down. Plus most of the mainstream media, grown tired of bombastic declarations like October’s pronouncement that being prosecuted for illegal electronic spying is like being raped, just ignored it rather than expressing their outrage. 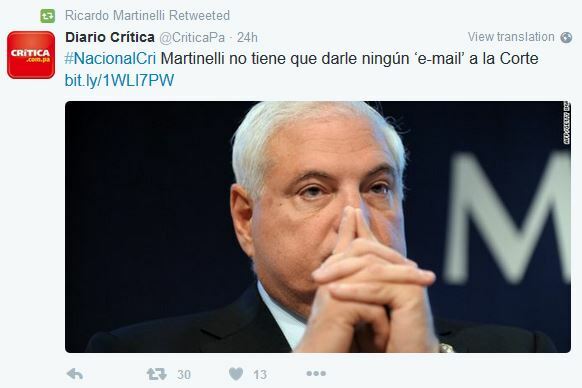 And that might forbode the very worst political fate for Martinelli: irrelevance. The Supreme Court has decided to accept a half dozen criminal cases against the former president and there are as many more out there still to be accepted or rejected. But all of them are at different initial stages and moving slowly. The most advanced of these cases, about illegal electronic eavesdropping, is at the procedural point of giving formal notice of a possible criminal charge. Martinelli, who is living in apartment 1901 of the Atlantis Building at 2025 Brickell Avenue in Miami, is playing this “You can’t serve me!” game. It appears that notice will be filed through Panamanian diplomats in the United States with US authorities and the high court here will consider him served. He knows, everybody knows he knows, and we can rest assured that his lawyers will argue that he doesn’t know. Notwithstanding that, Panamanian justice should soon be at the point of asking INTERPOL for a “red alert” request for Martinelli’s arrest and extradition. The ball would then be in the Obama administration’s court, unless Martinelli flees the United States for some other country that will have him. The former president left his wife Marta Linares de Martinelli with a power of attorney to manage his affairs when he fled Panama last January. His eldest son Ricardo Alberto Martinelli Linares also left Panama last January and in October his younger son Luis Enrique Martinelli Linares headed off in daddy’s jet to the Dominican Republic when prosecutors and the press started to ask about his roles in the Financial Pacific scandal and hydroelectric dam projects in which the Martinelli family held secret stakes. Marta left earlier this month, vowing to return on November 16, but in the meantime prosecutors have asked the Electoral Tribunal to strip her and her son Ricardo’s immunity from criminal investigation and prosecution as candidates for Cambio Democratico party offices. For mother it’s about overpriced government purchases of holiday food bags — about $46 each for things that should have cost $30 to $35 — with suspected kickbacks. For son it’s about a hidden Martinelli interest in a National Lottery game. Is President Varela especially eager to get the Martinellis back here and before the bar of Panamanian justice? Is the United States disposed to send the former president back here? The answers to these questions are not readily apparent. At this point only one member of Martinelli’s inner circle, former Supreme Court president Alejandro Moncada Luna, is serving a prison sentence. Five former ministers are behind bars in pretrial preventive detention, as are two former national security directors. A number of other top Martinelli administration officials are under house arrest or subject to travel restrictions. Inner circle member and formally the publisher of Martinelli’s El Panama America newspaper, Gabriel Btesh, is a fugitive. So is the ex-president’s personal secretary Chichi De Obarrio and another businessman and close confidante of Martinelli’s, Ricky Calvo. Others, like former tourism minister Salomón Shamah, have dropped out of public view. On paper Ricardo Martinelli’s Cambio Democratico party is still the nation’s second-largest political formation, but most of the public officials elected on that ticket openly defy the ex-president’s orders. Internal party elections have been put off in the face of the likely prospect that the group will be taken away from its founder and the only boss it has ever known. But it might better serve the current president’s interests to have a Cambio Democratico with a disreputable leader sending out Twitter messages from Miami than a post-Martinelli CD functioning as a more unified opposition party.